My wife and I went to the cinema recently to see the film “Darkest Hour”. The film tells the story of Winston Churchill during the early days of his time as Prime Minister of Britain during the Second World War. It’s a fantastic film and I really recommend you go to see it if you haven’t already done so. One of the things that stood out for me was the incredible courage and self-confidence shown by Churchill at this point during the war, when Britain’s fate in the war looked very uncertain. The German armies were marching across Western Europe defeating all before them and an invasion of Britain seemed inevitable after the imminent loss of the vast majority of the British army in Northern France. 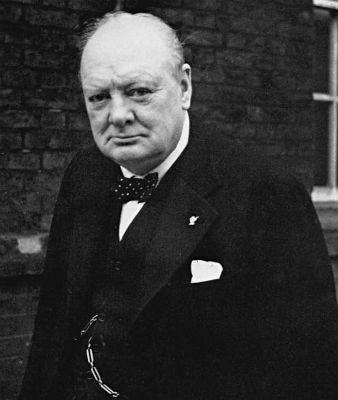 Churchill had formed his war Cabinet of senior politicians and advisors to help direct the British war effort but from the very start it seemed that rather than supporting him, they opposed Churchill’s plans to evacuate the British army from France and begin the fightback against Germany. Even the two most senior members of his own party, Chamberlain and Halifax, opposed his plans to fight and tried to persuade him to negotiate a peace treaty. Churchill was adamant that a peace treaty would be futile and the only course of action was to fight. Where on earth did he find the self-confidence to stand up against such overwhelming pressure and lead Britain to eventual victory in the war? No doubt there are many factors that contribute to self-confidence but one of the most important ones is having the help and support of people around you. In Churchill’s case the rock that he was able to lean on when he needed that support was his wife Clementine. It was Clementine who encouraged him to take on the role of Prime Minister and she was there to support and encourage him when the pressure to back down and negotiate a peace treaty would have been almost irresistible. In Churchill’s own words “My most brilliant achievement was my ability to be able to persuade my wife to marry me.” He knew how important it was to surround himself with supportive people! None of us are ever likely to face a situation as perilous as Churchill but we all face challenges in our daily lives. How do you feel when problems crop up? Do you feel confident in your own ability to deal with them or do you always have that nagging voice in your head which says “I can’t do this”. Don’t worry if you do – we all experience this feeling known as self-doubt from time to time. So what can we do to relieve these feelings of self-doubt and build confidence in ourselves? One of the first things you need to do is follow the example of Churchill in his Darkest Hour. You see one of the major causes of self-doubt is people who either fail to support you or who actually fuel your negative feelings. Don’t listen to people who bring you down. They are like a poison for your mind and a drain on your energy. Be careful of your friends. If you have friends who are frequently negative about things then start to politely distance yourself from them. Don’t allow their negativity to rub off on you. Churchill’s closest allies in his war cabinet should have been his political colleagues, Chamberlain and Halifax, but they were constantly negative about his plans and tried to talk him out of what he believed in. Churchill’s response was to distance himself from them and instead listen to supportive people such as the King and his wife. People who believed in him and encouraged him. Be aware of friends who think they are doing you a favour by talking you out of doing things. This will subconsciously reinforce any thoughts you have that say you can’t do things. Surround yourself with people who support and encourage you or reassure you when times get tough. Friends and family can be good sources of support but I know of people who find a supportive stranger such as a therapist or coach to be effective too. Identify those people who support you, and nurture your relationships with them. They will be important for giving you strength and confidence when feeling down. There are many ways to help improve your self-confidence but the first thing you should do is follow the example of Churchill by surrounding yourself with positive and supportive people and distancing yourself from those who are negative. This will help you develop the confidence you need when faced with your own darkest hours.